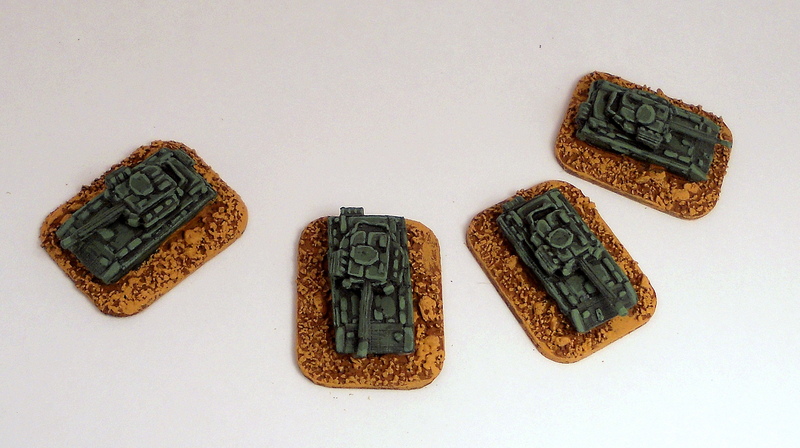 Here are a few photos of a 6mm battlegroup I just completed for Future War Commander. 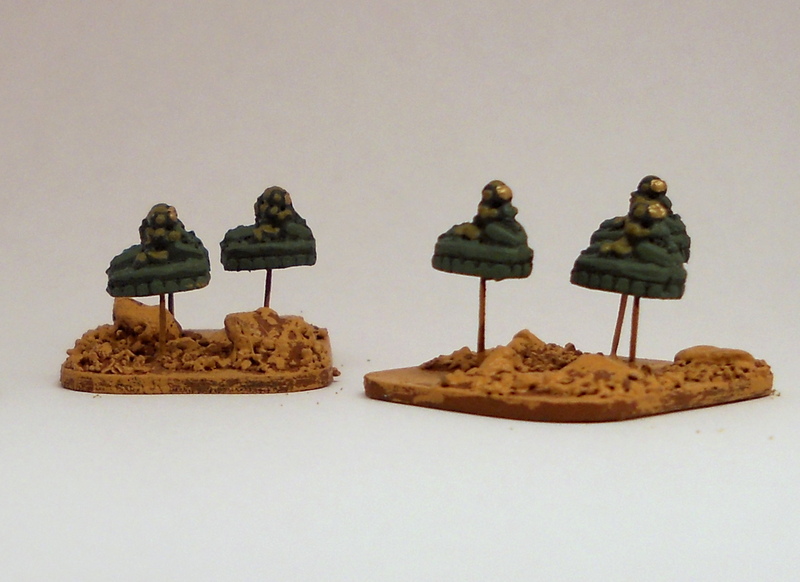 Most of the items are made by Ground Zero Games, which I highly recommend. This was the first time I have ordered anything from GZG, but it was reasonably priced and arrived quickly. I think it took less than a week to reach me in the wilds of Texas. Best of all, the castings are all well-detailed, especially for such a small scale. There was a bit of flash to clean up, but that was not a major issue. First up are the command units of the force. I modified one of the vehicles on the CO’s stand with some bits and pieces to make it look a little more interesting. I wanted it to resemble an anti-aircraft version of the same vehicle, escorting the CO’s vehicle. 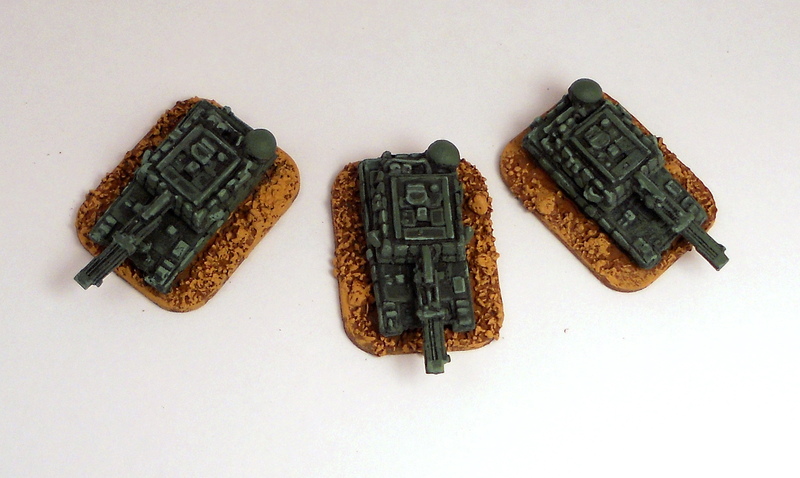 These next ones are the Zeta armored personnel carriers. They have a sort of art deco style that reminds me of luxury cars or passenger trains of the 1930s. The kind of vehicle you’d see a a fella wearing a top hat and monocle stepping out of. Next up are the scout walkers. I don’t know why an army that can afford anti-gravity propulsion for something as big as a command vehicle might need a vehicle with legs, but they looked too cool to pass up, so there you go. Here is the air support for the troops. 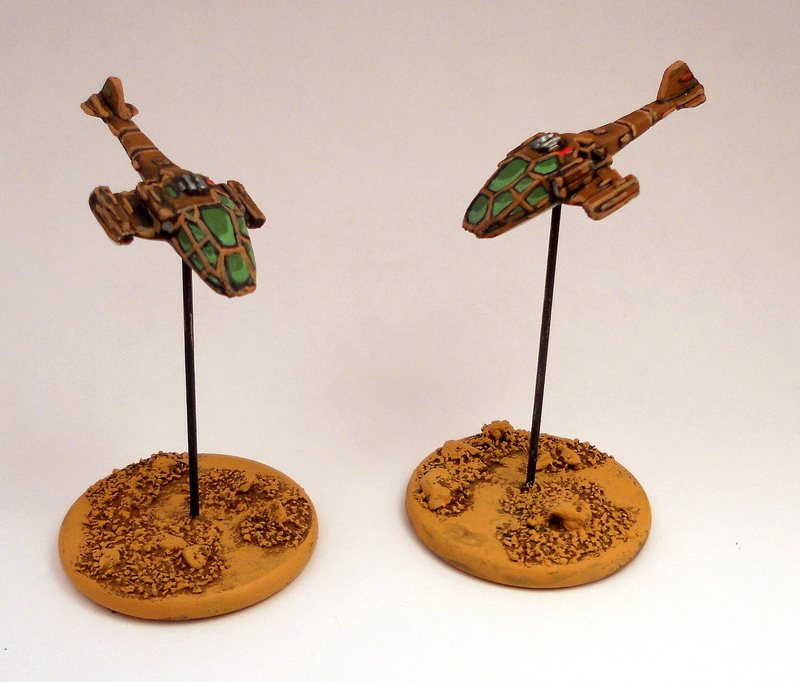 GZG provides clear plastic “flight” stands with these, which are nice, but I prefer to base my aircraft this way. The flight stands went straight into my parts box, but I can incorporate them into some futuristic structure or piece of terrain. Win-win. 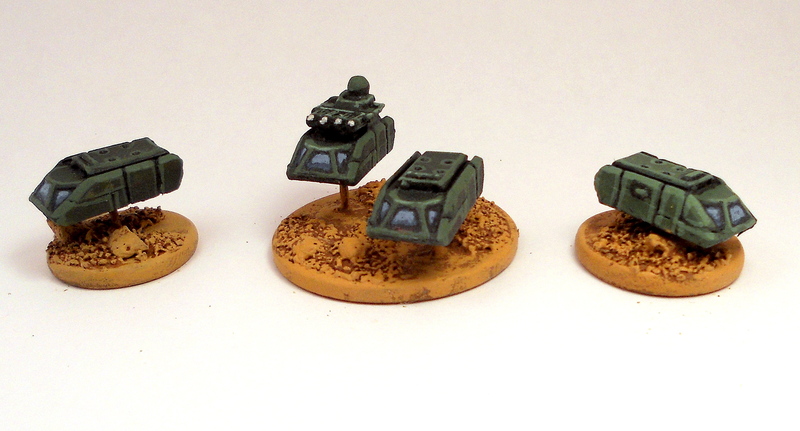 Here are some of my rapid-response troops, listed in GZG’s index as “NAC Skimmers”. 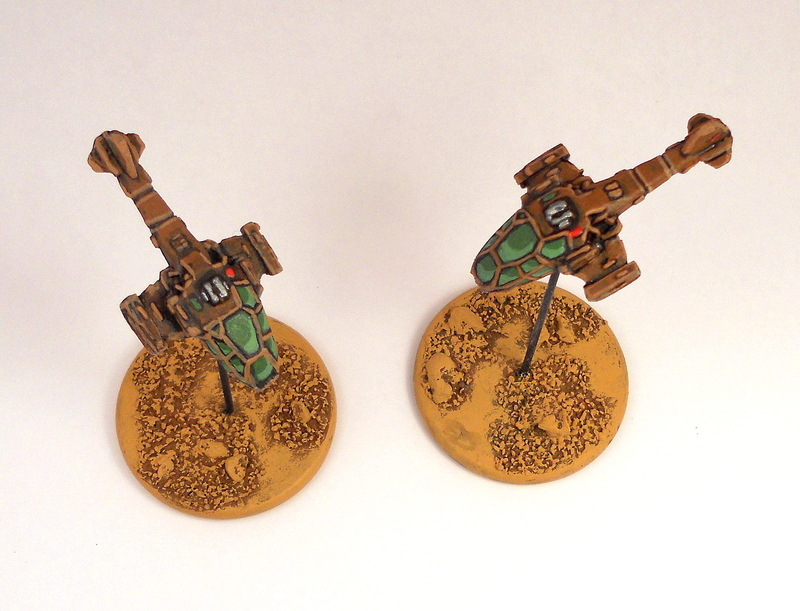 They are infantry riding small, one-man anti-gravity sleds. Next up are the medics. 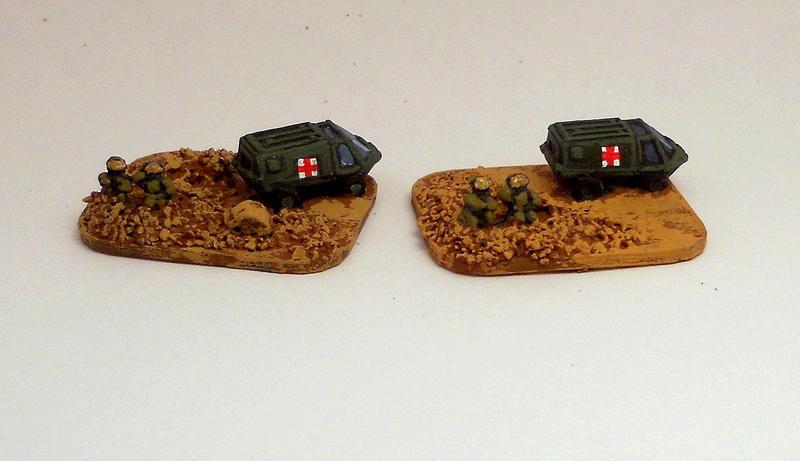 My dad was wounded as a medevac pilot in Vietnam, so I have a soft spot for those guys and look for opportunities to include medics in my armies whenever I can. Fortunately, FWC contains a rule for medics, so I used it. 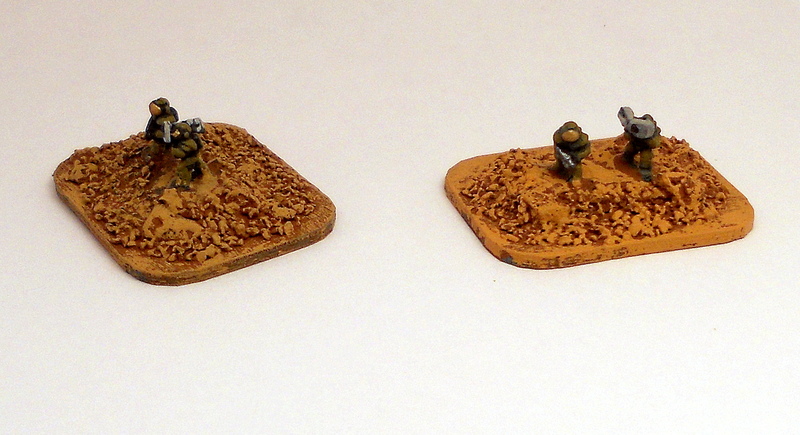 The vehicles are by GZG (listed as “rangetrucks”), but the two men kneeling on the ground are by Main Force Miniatures. 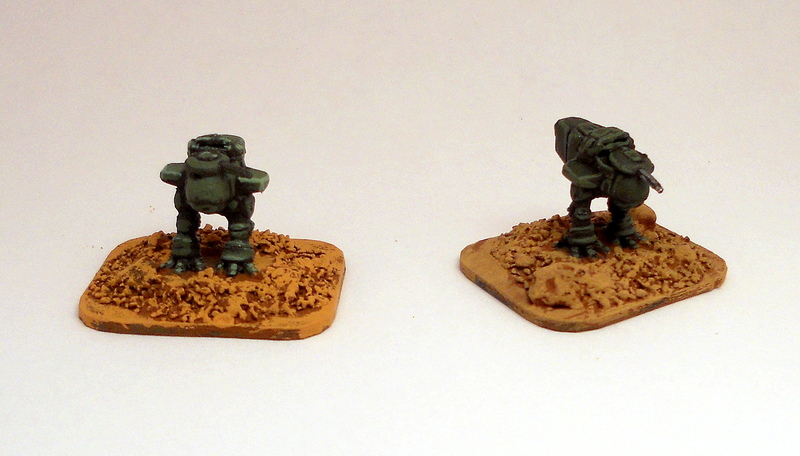 They’re actually supposed to be modern-day Russians, but I thought the molding was ambiguous enough to paint them like the rest of my sci-fi troops.